Although the Blazers may have lost 80% of their starting lineup from last season, they still have a budding superstar to build around in Damian Lillard. 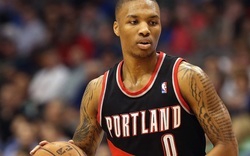 Lillard is one of the most intriguing Blazers' players in recent memory as he combines frightening good looks with clutch shooting ability and a marketable personality. The Blazers may be up and down this year, but the games are always fun to go to. The Moda Center underwent construction in 1993 and opened in 1995 and is a lasting venue for countless Portland area sports teams - not just the most popular Blazers. If basketball isn't your thing, jet on over to watch the Portland Winterhawks of the Western Hockey League or the Portland Lumberjax of the National Lacrosse League. And when I say jet on over, I mean book a limo through Vancouver Limo Service PDX. Sporting events are a super fun place to go hang out with buds and knock back a couple adult beverages. The only issue is driving to and from poses a great risk. Why not snag a limo from us, get transported safely and effortlessly to and from the arena and even have a stop off at a local pub while you're out and about! Our fleet is modern, our schedule flexible, our service impeccable, our drivers professional and our prices affordable.